According to a study, published in the American Journal of Clinical Nutrition, the ability to chew your food thoroughly could be the key factor to reaching fullness and satiety without the need for bigger portions. In a randomized study, carried out by Purdue University, researchers looked at what chewing almonds had on 13 healthy individuals. 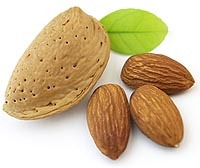 Using blood samples and monitoring their appetite, researchers found that those who chewed their almonds between 25 – 40 times before swallowing, resulted in a better absorption of good fats and feelings of satiety, in comparison to those who only chewed the almonds about 10 times before swallowing. "This new almond research indicates that chewing more thoroughly may increase the availability of unsaturated fat and previous research suggests smaller particle size also impacts the availability of other nutrients present in the fat, like vitamin E, to the body," explained study author Richard Mattes, PhD, RD, at Purdue University. "These findings also emphasize the importance of examining chewing in the context of a weight management plan because participants reported their hunger was suppressed and their fullness was enhanced as a result of increased chewing of the almonds."